The Citizens’ Councils formed in the Mississippi Delta just months after the US Supreme Court handed down its landmark Brown v. Board of Education decision in 1954. Founder William “Tut” Patterson was determined to fight the integration of Mississippi’s public schools and began to gather individuals who shared his resolve. When William J. Simmons became the organization’s primary strategist for positioning the Councils in the court of public opinion, he knew that mass distribution of its message would be key. The organization had quickly outgrown its pamphlet and town-meeting-style information distribution system and needed a communication tool to help promote its ideologies beyond Mississippi’s borders. The first edition of the Citizens’ Council was published in October 1955. The four-page newspaper-style monthly newsletter became the “official publication of the Citizens’ Council,” and organizers claimed distribution to all fifty states and beyond. The publication was “dedicated to the maintenance of peace, good order, and tranquility in our community and in our State and to the preservation of States’ Rights.” With extreme optimism, the Council printed 125,000 copies of the first issue for distribution to like-minded individuals throughout the South. Subsequent print runs dropped substantially, and Simmons estimated the average circulation at 40,000 in November 1956. At first glance, the Citizens’ Council could have easily been mistaken for a small-town weekly, since it featured many traditional newspaper elements (a distinct nameplate, letters to the editor, and political cartoons). 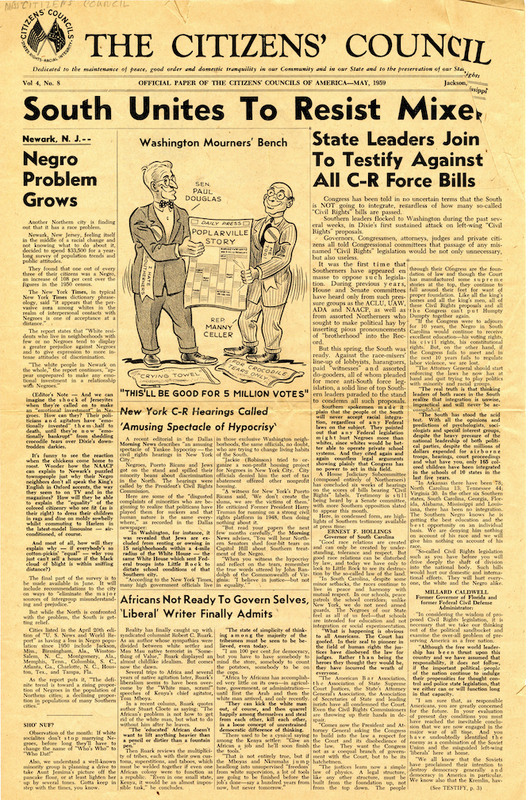 However, each monthly edition featured a very focused and strategic message: supporters needed to mobilize and fight to preserve segregated classrooms in the South. Because it did not carry advertising, the publication became the mouthpiece for the Councils, offering editors complete license to espouse the organization’s propaganda. Contributors promoted participation in the Citizens’ Councils as a means to preserve the “southern way of life.” Charts, maps, and stories detailed the organization’s rapid growth and radio and television efforts. The Citizens’ Council filled its pages with stories from journalists across the South. Thomas Waring, editor of South Carolina’s Charleston News and Courier, was a frequent contributor. Early issues included Waring’s three-part series on the formation of the Citizens’ Council and its benefits for southerners. Other contributions included editorial comment from the pages of the Jackson Clarion-Ledger, Prentiss Headlight, Natchez Times, and Winston County Journal, while Council supporters authored guest editorials. The Citizens’ Council maintained its four-page newspaper layout for five years. In October 1961 the format changed to a newsmagazine-style publication and the name was shortened to The Citizen. At this point, the content shifted to longer pieces written as features. The magazine often devoted entire issues to one specific topic, with articles contributed by prestigious members of Congress, scientists, authors, and clergy. Each issue sold for thirty-five cents; a yearly subscription cost three dollars. Although the appearance changed, the message remained the same—organizing to resist desegregation. Attacking the credibility and patriotism of civil rights proponents, providing data to support the demise of society should integration occur, and continuing to encourage active resistance remained the publication’s primary focus. In 1961, the organization reported 50,000 subscribers, but that number dropped to 23,056 the following year. By the mid-1960s the Citizens’ Councils and their publications began to promote the idea of private school education as an alternative to integrated public school systems. The Citizen remained in publication until 1989 with Simmons as publisher.